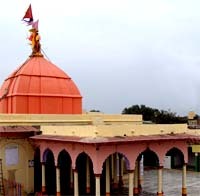 Balaram Temple is dedicated to Balarama, the elder brother of Sri Krishna. It is located at Baldeo which is around 20 km from Mathura in Uttar Pradesh. The main murti in this temple is that of Balarama. Another important deity worshipped at the temple is Revathi, wife of Balram. The murti of Balaram here is black in color and is one the biggest murtis in Mathura and Vrindavan. The temple has a huge courtyard and the walls have inscriptions in Sanskrit and Hindi. Balram is also known as Baldeo or Dauji. Kshir Sagar Kund, also known as Balbhadra Kund, is a holy pond next to the temple. The temple is around 7 km from Mahavan another holy place near Mathura. Vehicles are not allowed in the vicinity of the temple.